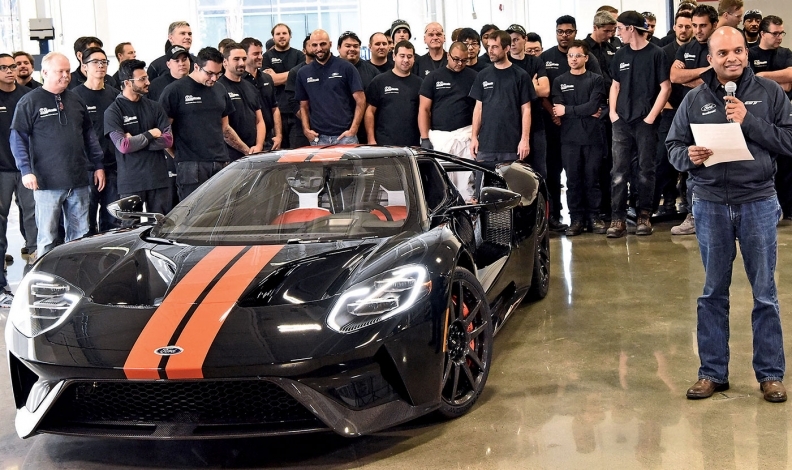 Ford's Raj Nair marked Job 1 for the Ford GT at Multimatic in Markham, Ont. Ford Motor Co. has delayed delivery of some Canadian-built GT supercars following supplier constraints and homologation testing issues as part of an extended production ramp-up. Ford began production of the GT in December at Multimatic Inc.'s plant in Markham, Ont. To date, it has delivered about 50 GTs, according to a spokesman. But the automaker sent a letter to would-be GT owners earlier this week, saying, "The craftsmanship required to build these vehicles for global markets has required that we adjust our original timing projections." Ford declined to say how long the delays would be, saying in a statement that it has "nearly completed" the ramp-up process. Once the ramp-up phase is complete, Ford will build one GT a day. The automaker has limited production to 250 a year and will produce the GT through the 2020 model year.